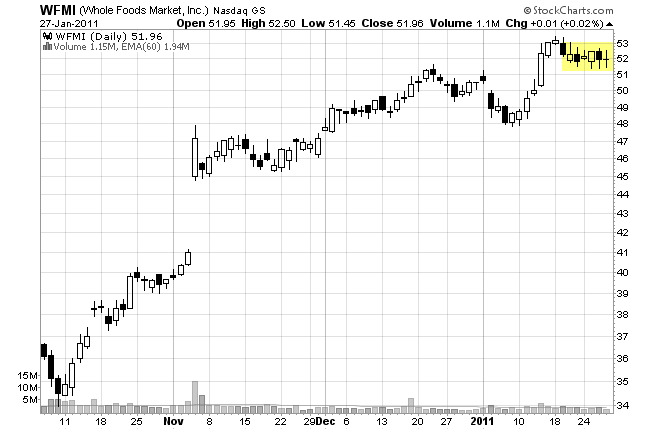 This chart pattern is a good example of why the majority of stock traders lose money. They get caught (trapped) on the wrong side of a move. This results in some potentially explosive moves in a stock. We have talked about the swing trap chart pattern. This pattern is similar in that it catches traders on the wrong side of a move. What are your thoughts about this stock? You, like most traders, are probably thinking that this stock is trading sideways (consolidating) but since it is in an uptrend, it may breakout soon. And you would be right in thinking this. 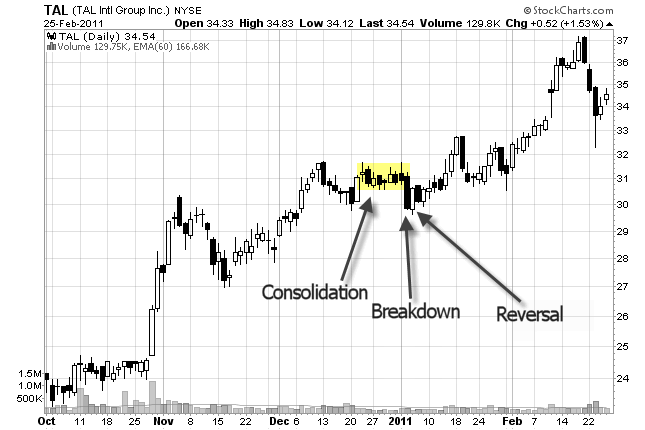 There are some traders that are buying this stock inside of the consolidation in anticipation of a breakout. 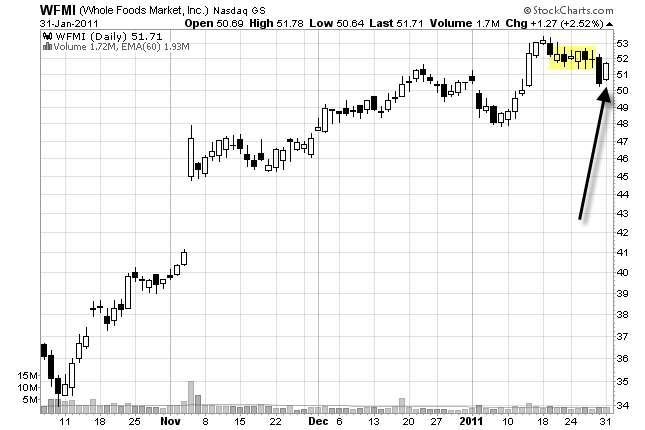 But really, there is nothing to do with this stock except wait for a breakout. Remember that there are thousands of traders looking at this stock. And they are thinking the same thing that you are. Now, what are your thoughts about this stock? 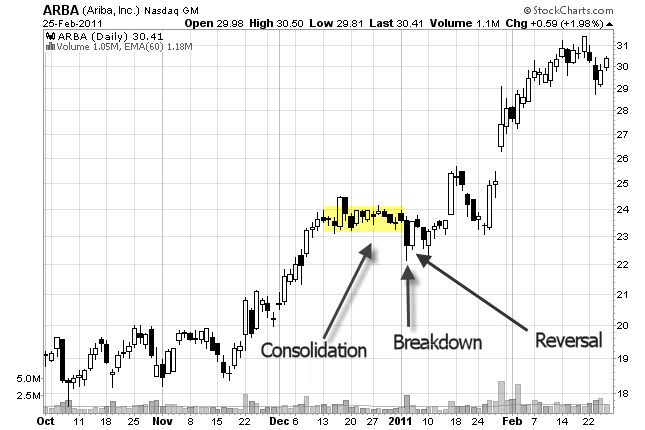 Well, the stock broke down through the consolidation. And, it closed with a very bearish candle that closed near the bottom of the intra day range. There are some traders that got stopped out (they put their stop under the lows of the consolidation) and there are some traders that have aggressively shorted this stock. So no matter how you look at it - at this point this stock looks bearish. Plain and simple. Whoa! What just happened? There was no follow through to the down side. This means that there are no sellers left to move this stock lower. So, with all sellers flushed out, this stock can now move higher. Also keep in mind that those traders that shorted this stock on the day of the breakdown probably put their stop loss orders above the consolidation. When the stock moved above that area, their stop loss orders were taken out - causing the gap up. 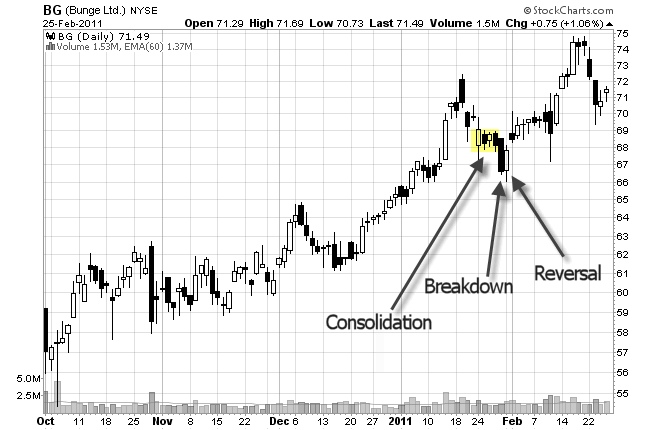 You need a sideways consolidation, then a breakdown causing the chart to look bearish, and finally a reversal pattern. This is why this pattern is called a "side trap". The stock trades sideways and then traps traders who shorted the breakdown. You want to establish a position with this stock on the day of the reversal candle. But, you do not want to trade just any reversal candle. You want the candle to be strong one. Make sure it closes at least halfway into the range of the breakdown candle. This will show up as a piercing candlestick pattern or a bullish engulfing candlestick pattern (see the examples above). Nothing special here. Just trail your stops using your favorite exit strategy. However, when the stock market offers you a gift - take it! If the stock explodes, and goes up 15% in a couple of days, at least take partial profits and trail your stops on the rest. 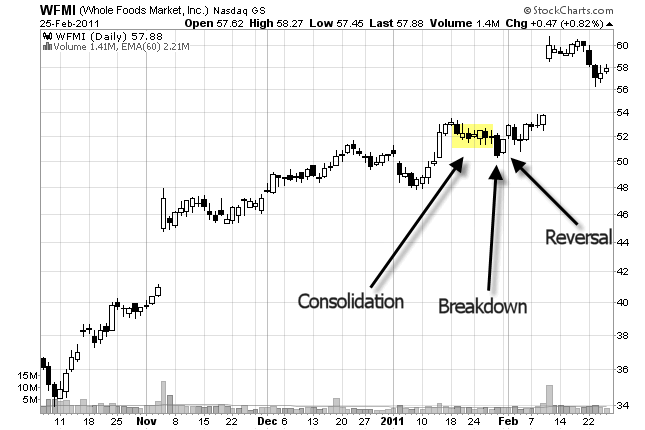 Keep in mind that you are wanting to see this stock move above that sideways trading pattern (consolidation). That is where the explosiveness will kick in. Create a scan for this pattern? I don't scan specifically for this pattern. I just run a general pull back scan and look for this pattern. If I see a consolidation forming, I will add it to my watch list to see if the breakdown candle forms - then wait to see if a reversal occurs. You could create a scan that searches for a piercing candlestick pattern or a bullish engulfing candlestick pattern. Then you can sift though the stocks to see if this pattern shows up. It's up to you. The longer the consolidation the more potential for an explosive move. The reversal candle must be a powerful one. Volume is not important but you may see high volume on the breakdown candle. If the overall market (S&P 500) has a big down day, the odds of this pattern showing up increases. 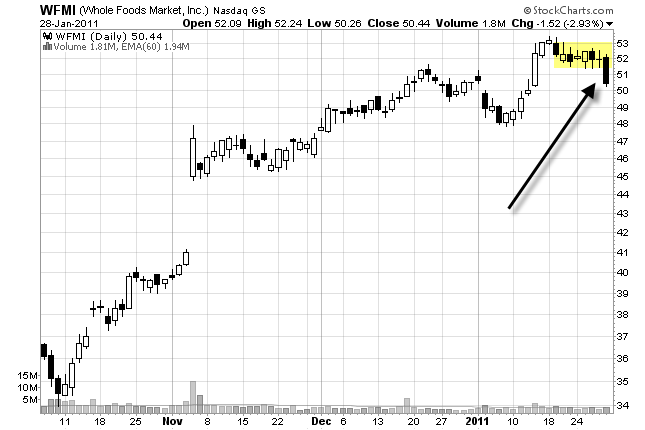 There are two things that I love about this chart pattern. First, you are establishing a position after a wave of selling has occurred. And second, you are trading opposite the crowd. These are the two components of successful swing trading.